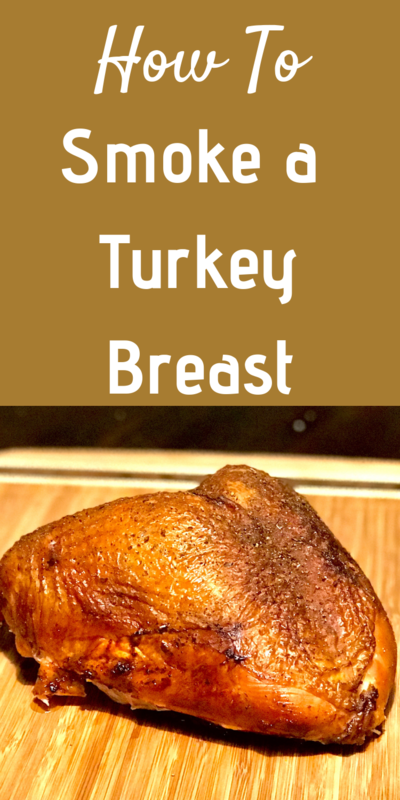 My father used to make the most amazingly juicy and flavorful turkey. And not just for Thanksgiving in November. We would have a full blown Thanksgiving dinner about 4 times a year, complete with stuffing, pies and cranberry sauce. And my dad never ruined a turkey. Not once. But he roasted his in the oven ALL DAY which was a bit labor intensive and required some serious skill in order to achieve juicy meat and crispy skin. I will never be able to roast a turkey like he did, and I’m ok with that because I’ll always remember that he was THAT good at it. We plan on traveling out of town this Thanksgiving and its definitely not ideal to pack up the Traeger Timberline and smoke a whole turkey so we’re doing the next best thing. Using the Traeger Ranger Portable Smoker and Grill and we’re smoking a turkey breast. 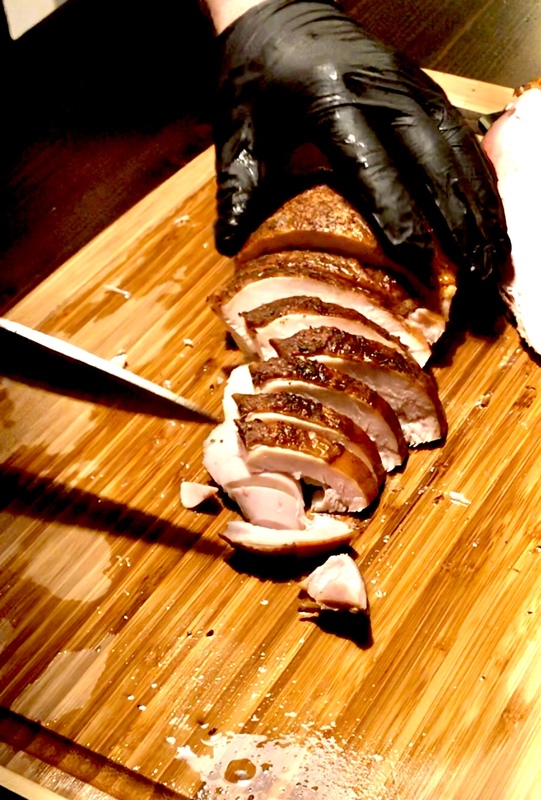 Here’s the recipe for the finest smoked turkey breast you’ve ever had. This recipe requires brining so plan ahead and give yourself enough time to properly brine your turkey. Brine the 5-7 lb turkey breast for at least 12 hours (overnight) but you can leave it in the brine for up to 24 hours. In a 5 gallon bucket, combine ¾ C Kosher or Pickling Salt, 4 Tbsp Dark Brown Sugar and 2 Tbsp poultry rub with 1 gallon warm water. Once all the salt, brown sugar and rub have dissolved, add 2 lbs ice to cool down brine mixture. Once brine is cold, place your turkey breast side down in the brine. Make sure it is completely submerged. You may want to place something in your 5 gallon bucket to keep the turkey from moving. Leave your bucket in the fridge or in a cooler surrounded by ice for 12-24 hours. Preheat your smoker to 180 degrees F and remove your turkey from the brine. 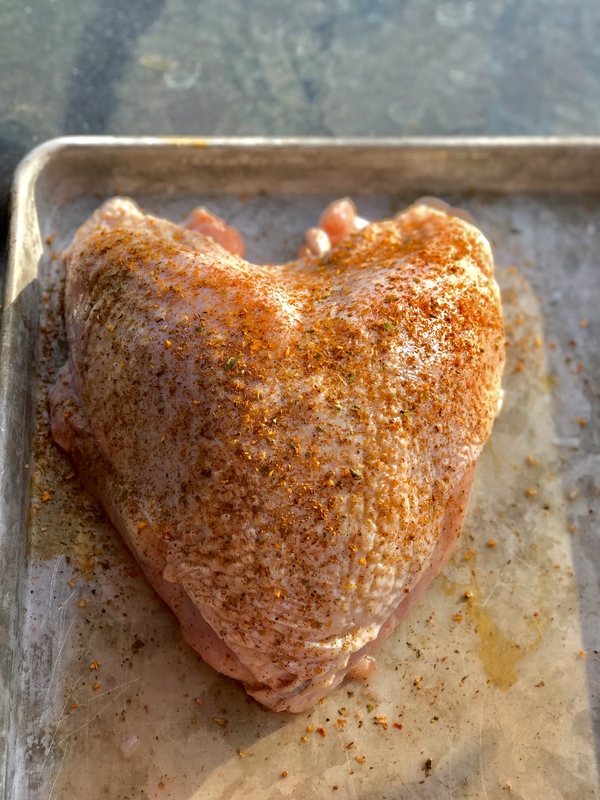 Cover breast with seasoning of your choice. 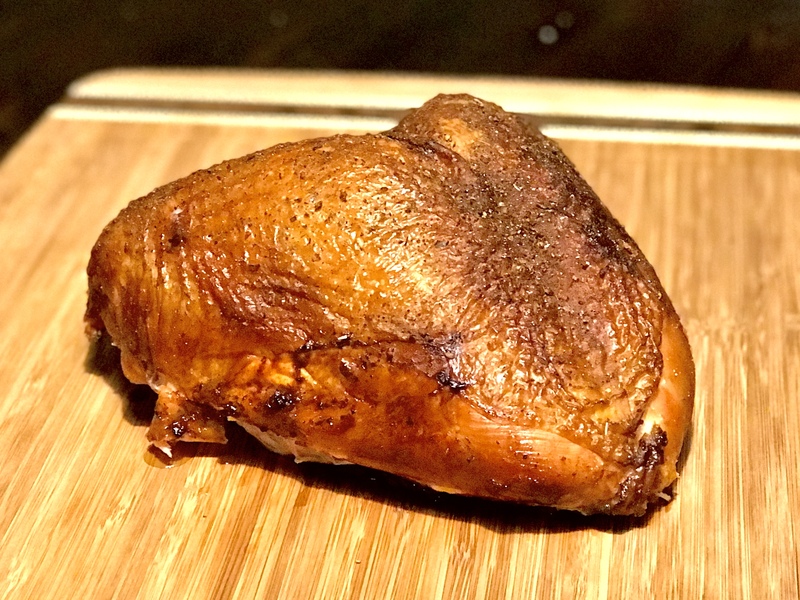 I used Traeger Fin and Feather Rub for this cook. 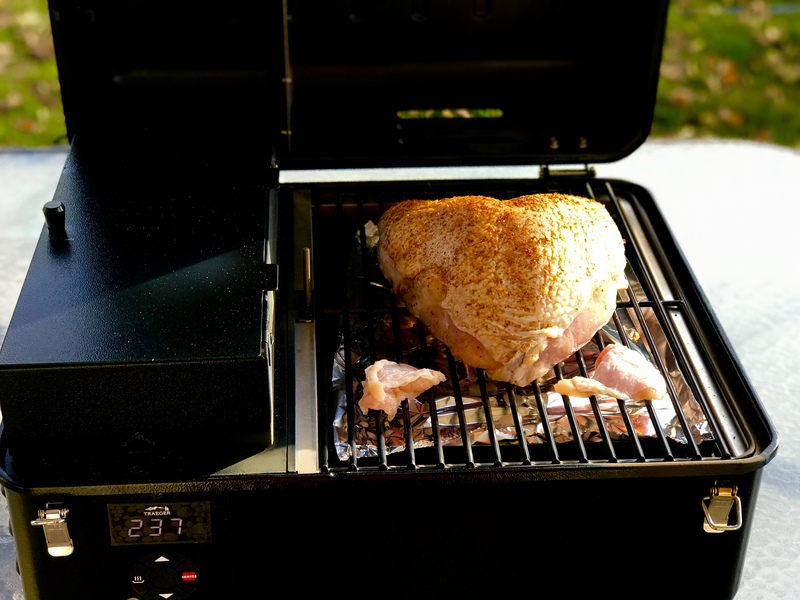 Place turkey breast directly on the grill and insert a probe thermometer into the thickest part of the breast. 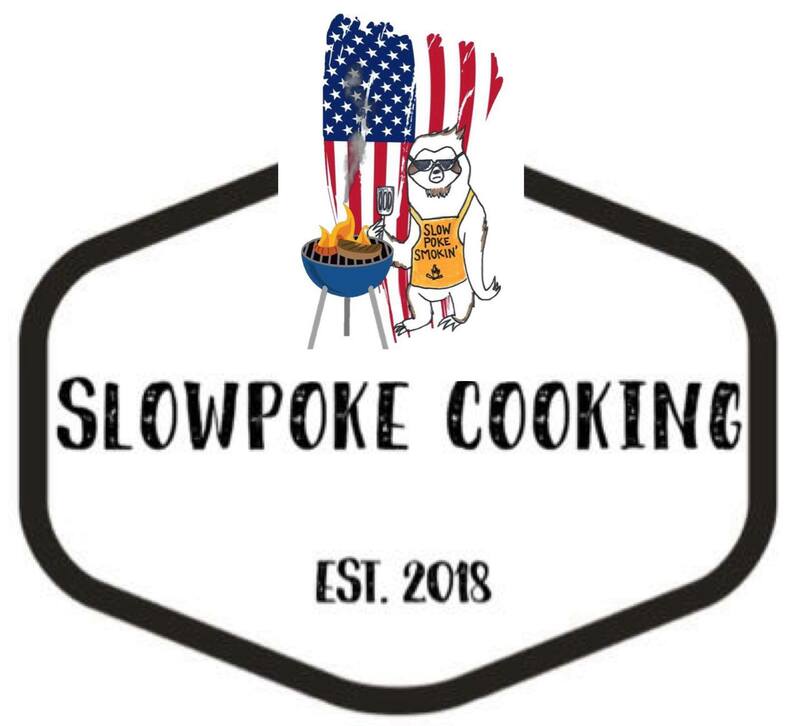 Smoke for 1.5-2.5 hours at 180 degrees F.
Once your turkey breast reaches 140 degrees F, increase your heat to 350 degrees F and finish cooking until the internal temperature reads 165 degrees F.
Remove from grill and let rest for 15-20 minutes. Some folks carve their turkey breast while it is still on the bone lengthwise. I prefer to remove the breast meat and slice it the short way (as pictured). 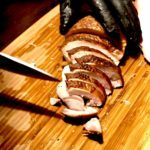 This cut doesn’t take up as much room on your plate so you’ll have space for other foods to compliment your juicy, delicious turkey breast. Increase heat to 350 degrees F and cook until internal temperature reaches 165 degrees F.